When I saw a link to the latest Cartoon Caption Comp using a beautiful picture drawn by India, I wondered what pun I could write. I'm just a little outside the top of the age range (but I was 13 once back in the 1960s) so my entry doesn't really count. A man poked himself in the eye with his souvenir from Paris. He had an Eiffel of tower. Okay, it's not a great example but it's getting late at night down here in Australia but I think you get the idea. Puns can be hard to write, the short stories I write on one of my blogs are much easier but I saw India's drawing and thought I would try. I've reproduced India's drawing here in case a reader wants to see the picture to match my pun. I hope India doesn't mind. 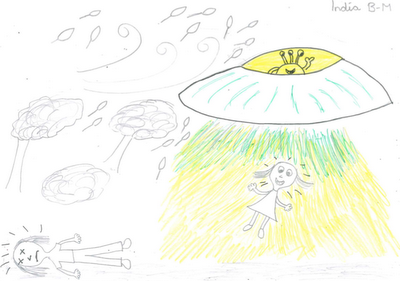 A girl was being abducted by aliens. Her experience was out of this world. Puns may be hard to write but some people seem to excel at the unusual form of joke. I have seen some of the current entries and can see there are some developing pun specialists out there. Posted in Education, Writing on May 23, 2012 by rossmannell.